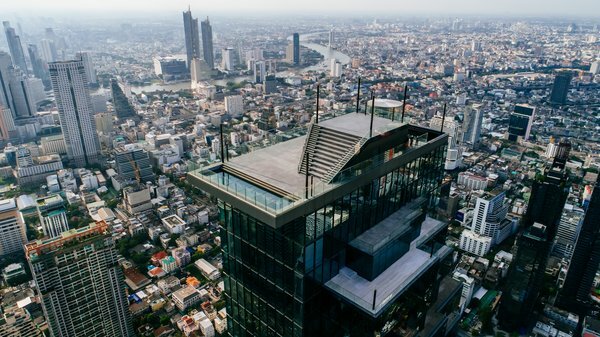 King Power Mahanakhon unveils Mahanakhon SkyWalk — Thailand’s highest 360-degree observation deck and rooftop bar at 314 meters high, offering spectacular panoramic views of the city from Thailand’s tallest building. The new premium attraction opened its doors to the public on 16 November 2018. Located on the 74th, 75th and 78th floor of the King Power Mahanakhon Building, highlights of the indoor and outdoor observation deck include one of the world’s largest glass tray floors, Thailand’s highest Rooftop Bar, and Thailand’s fastest video-themed elevators — which allows visitors to ascend to the 74th floor in 50 seconds. Located in the heart of Bangkok’s central business district and directly connected to Chong Nonsi BTS station, the attraction is to become a global landmark destination that transforms Thailand’s tourism scene into a truly international force. 74th Floor: Indoor Observation Deck. Experience 360-degree panoramic views and learn about Bangkok’s key landmark destinations through interactive screens and an Augmented Reality experience. Send postcards to loved ones from Thailand’s highest post-box! One of Asia Pacific’s leading centers for duty free goods, world-class brand name products, exclusive Mahanakhon SkyWalk souvenirs, international quality Thai products and creations, and an array of lifestyle products. More details to be announced in the next phase. Luxury living at its best. A total of 209 luxurious freehold residences, ranging from 2-5 bedrooms; from 125 square meters to 844 square meters of space, with exclusive amenities and legendary service by the Ladies and Gentlemen of The Ritz-Carlton. Over 1,000 square meters of available space for exhibitions, performances and events in central Bangkok.